(Bloomberg) -- Oil refiners are getting ready for a boom. The plants in Europe and the U.S. are scaling back planned maintenance later this year in anticipation of a surge in demand and fatter margins as the shipping industry gets ready for a historic fuel switch. Analysts say a similar picture is emerging in Asia, too. Refiners in the Mediterranean and Northwest Europe so far arranged to take about 60 percent less capacity offline for routine work from September to November than they did a year earlier, according to data compiled by Bloomberg. There’s been a similar plunge in planned U.S. work. Even though more maintenance will come to light, most industry observers are nonetheless expecting fewer shutdowns. The rush to refine during what’s normally a fallow period for the industry is a response to the introduction in January in 2020 of rules to cut sulfur emissions from the shipping industry. The switch is forecast to send prices soaring for fuels that allow owners to comply with the regulations, according to the International Energy Agency. The measures are widely expected to create a profit surge for some refiners. Refineries typically plan maintenance in the spring and autumn in order to gear up for stronger fuel demand in the summer and winter months. Europe’s oil refiners are so far scheduled to halt an average of 520,000 barrels per day of crude-processing capacity from September to November, the data show. That’s less than half the 1.3 million barrels per day they took offline in the same period last year -- including both planned and unplanned stoppages. One such company is Saras SpA, which operates the 300,000-barrel-a-day Sarroch refinery in Sardinia, one of the biggest plants in the Mediterranean market. The Italian company is expecting higher average refining margins year-on-year, especially from the second half of 2019, when the new regulation “will start to have effect,” it said in a March 4 earnings presentation. The refiner concentrated its maintenance work in the first quarter of this year “in order to be ready to capture better market opportunities arising from IMO,” it said. Likewise, Spain’s Repsol SA and Tupras Turkiye Petrol Rafinerileri AS are also conducting the bulk of their 2019 work in the first half of the year. Both are doing so with a view to capturing higher margins associated with IMO 2020, according to Bloomberg Intelligence analyst Salih Yilmaz. While 2018’s work was divided roughly equally between the 1.3 million barrels a day halted in Spring and 1.1 million barrels a day in Autumn, this year’s schedule for Spring is currently double what’s expected to take place in Autumn. It’s important to note that refineries often try to keep plans about work private because the information can be commercially sensitive. Plants also stop unexpectedly. That means this Autumn’s figure is sure to rise as the year progresses. “This year’s refinery work is particularly front-loaded, likely due to IMO 2020,” researcher Energy Aspects Ltd. said in an emailed note on March 13. The rule capping the amount of sulfur in fuel used to power the world’s merchant ships is forecast to boost prices for distillate fuels like diesel and marine gasoil, which will be used to meet the regulations. While the rules enter into force in 2020, owners are expected to start running new fuels before then to be sure of issues like compatibility and avoid a sudden switch. Even so, the push to produce more distillate fuels could have secondary impacts. That’s because every barrel of crude that’s processed generates a mixture of refined fuels -- such as gasoline, jet fuel, diesel and fuel oil -- in varying amounts, depending on which crudes the refinery buys, and its configuration. Global crude markets have this year been inundated with supplies of lighter crudes that are typically produced by U.S. shale oil fields which yield a higher proportion of lighter fuels like gasoline. At the same time, supplies of heavier, distillate-rich crudes have been curbed by restrictions on countries like Iran, Venezuela, as well as by wider OPEC output curtailments. 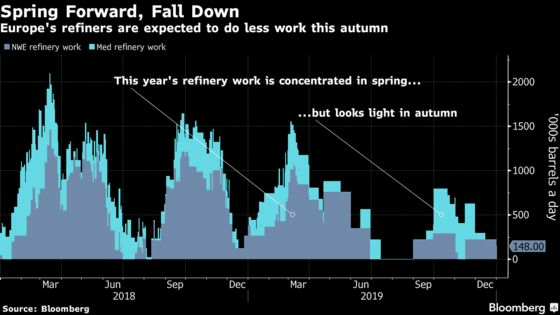 U.S. refineries have so far planned about 500,000 barrels a day of work from September to November, almost 50 percent down from a year earlier. At least nine refiners in the country are doing multi-unit turnarounds during the first two quarters, according to data compiled by Bloomberg. PBF Energy Inc. is accelerating the bulk of its 2019 refinery maintenance to the first half of the year to prepare for IMO 2020, the company said during its fourth quarter earnings call on Feb. 14. Valero Energy Corp. moved a multi-unit turnaround at its Memphis, Tenn., refinery to April from the fourth quarter, according to people familiar with operations. Work has also happened earlier in the year in Asia, according to Amrita Sen, chief oil analyst and head of research at Energy Aspects.